PLEASE USE THIS AREA TO DESCRIBE THE GENERAL FOOD SERVICE THAT YOU WILL PROVIDE AND HOW IT FITS INTO THE THEME OF EACH FESTIVAL. Not all booth requests can be accommodated. We will do our best to take all requests into consideration. Please list the other Events & Festivals in which your business has participated. The Simi Valley Music & Funtasy Festival has the right to deny sale of any item. The Simi Valley Music & Funtasy Festival has the right to deny sale of any item. Items may be denied due to price point. 1. Merchant/Booth Owner agrees to comply with all terms and conditions of this agreement, the rules, regulations and policies of the Festival, and with all applicable federal, state, and local laws and regulations including those relating to payment of taxes and licenses. 2. Merchant and their employees will comply with all rules and regulations set forth by SVMFF. 3. Merchants participation in the Festival is hereby relinquished if the signed Letter of Agreement and all fees/deposits are not received by September 30, 2018. 4. If Merchant withdraws from the Festival within 30 days of opening, Merchant forfeits any and all prepaid fees /deposits and SVMFF will retain the booth fees/deposits. 5. This agreement is for the 2018 festival only. SVMFF has no obligation to renew this agreement for future seasons. SVMFF reserves the right to terminate this Agreement and remove any participant from the grounds for cause at any time. 6. Merchant is required to reimbursement SVMFF for any and all charges incurred on behalf of the Booth Owner including but not limited to permits and licenses necessary or incidental to the operation of Booth Owner's business at the Festival. 7. A Check for $100 must be submitted with fees and signed agreement as a cleaning fee deposit. This check will be held until the end of the festival. Upon leaving the festival the Merchant must have their booth area inspected for cleanliness and damages. If the area is deemed to be acceptable, the deposit check will be returned or destroyed. If the area is deemed unacceptable or merchant leaves without inspection, the check will be deposited. 8. Merchant may only sell what is listed on their approved Merchant Product List. Merchant will not deviate from the approved listed Items. Items not included on the Product Listing or that have not been approved may not be sold. SVMFF reserves the right to deny sale of items that have not been listed on the application. Any merchant found with items not listed on the application or approved by SVMFF will be asked to remove the item or leave the Festival without a refund. 9. Merchant must register all participants and staff working at the booth. SVMFF must be notified of all terminations immediately. Merchant must recover participant pass of terminated individuals. 10. Merchant shall keep booths and SVMFF free and clear of any mechanical liens. 11. Drug and Alcohol Policy: Merchant and their employees or volunteers may not consume alcohol or drugs during show hours on Festival site, nor distribute alcohol or drugs to anyone, whether a member of the public or a participant of the Festival. 12. Merchant agrees to the use of his/her name, photos, images, recorded voice, or music by SVMFF, as well as its employees, assignees and licensees in connection with the Festival and without inspection for any commercial or promotional uses for one hundred (100) years. 13. Merchant may use approved SVMFF trademarks, trade names, or copyrights to promote their participation in the accepted faire during the fiscal year of 7/1/18 to 6/30/19. No other use of SVMFF trademarks, trade names, or copyrights may be used for any other purpose or outside the stated time frame without express written permission. 14. Merchant must provide current emergency contact number and information. This information, along with your booth number, booth name, address, and phone number shall be securely attached to the front of your booth opening day and remain up for the entire run of festival. 15. Merchant must use a tent that is clearly labeled as fireproof. All components of the tent / canopies / 10x10 / pop ups to include sides, screens or other materials, must bear a fire retardant certification seal of the State Fire Marshall (SFM) office. 16. Merchant may build and decorate within the theme of the Festival. Merchant will provide and use professional looking signage. Use of staples, nails, screws, or bolts in living trees are prohibited. 17. Merchants may costume themselves and their workers within the theme of the festival while in public view at booth, speak in language appropriate to the era of the festival while in public contact, and assure that all booth personnel also comply with the requirements. 18. Merchants will provide proof of liability insurance on or before October 15, 2018, that shows The City Simi Valley, The Simi Valley Music and Funtasy Festival, Simi Valley Arts Alliance, their officers, directors, employees and/or agents as "additionally insured". The address listed should be 3855 Alamo Street, Simi Valley, CA 93063. $1,000,000 per incident and 2,000,000 aggregate. Without insurance you will not be allowed to open. No refund of booth fees will be granted in this case. Please submit your insurance certificate either the Vendor Marketplace Manager or Concessions Coordinator via mail, e?mail or fax before October 15, 2018. 19. Booth Owner Agrees to provide own workers comp insurance and take care of own hiring. Booth Owner will insure all that all hiring practices are in accordance with California State and U.S. Federal Labor Law. 20. Booth Owner agrees to hold the Festival harmless from any liability whatsoever: for any claim for injury (including, but not limited to bodily injury, property damage, fire, theft, explosion, damage incurred by the act of Nature), and for any loss sustained by Booth Owner or any person working for Booth Owner while participating in the Festival. This obligation to Booth Owner shall survive the termination or expiration of this Agreement, to defend, indemnify, and hold harmless SVMFF, SVAA and its officers, directors, agents, and employees from all claims, demands, losses or liabilities, including but not limited to attorney's fees and litigation costs and expenses, for any injury or damage to anyone (including family, friends, guests, agents, volunteers or employees of Booth Owner) arising from Booth Owner's preparation for, travel to and from, attendance at and participation in the Festival, whether authorized by this agreement or not. 21. Booth Owner will be held responsible for any damages incurred by himself, his workers or their guests. This includes but is not limited to booth construction, any property left on site, driving a vehicle on site and/or any damage that may occur as a result. 22. Oral agreements cannot supersede this agreement. Any modification of this agreement must be in writing, and signed by both parties. 23. This Festival is a "rain or shine event". The producers will not be held liable for refunds or any other liabilities whatsoever for the disruption of the Festival due to reasons of enclosure in which the Festival is to be produced, before or during the Festival, destroyed by fire or other calamity, or by any act of God (including but not limited to weather), public enemy, strikes, statutes, terrorists, ordinances or any other cause. Producer has the option to cancel the Simi Valley Music and Funtasy Festival by October 15, 2018 and will return booth fees to the exhibitors. Producer reserves the right to alter the booth layout plan at any time. 24. Booth Operator is aware of potential wind gusts of up to 70 miles per hour and is expected to prepare their space accordingly. Tents should be staked and/or weighted for safety. SVMFF Staff may not be available to provide additional labor in the event of high wind. 25. Any disputes or differences arising out of or in connection with this agreement shall be determined by the appointment of a single arbitrator to be agreed between the parties or failing agreement within fourteen days after either party has given to the other a written request to concur in the random appointment of an arbitrator. I understand and agree with all the conditions of this contract and furthermore certify that I agree to comply with all Festival Rules, Regulations, Conditions and Policies. I have read and understand the application process and agree to the terms and booth payment fees. 1. Caterer agrees to comply with all terms and conditions of this agreement, the rules and regulations of the Festival, and with all applicable federal, state, and local laws and regulations including those relating to payment of taxes and licenses. 3. If Caterer withdraws from the Festival within 30 days of Opening, Caterer forfeits any and all prepaid fees/deposits and SVMFF will retain the fees/deposits. 4. This Agreement is for the 2018 Festival. SVMFF has no obligation to renew this Agreement for future seasons. SVMFF reserves the right to terminate this Agreement and remove any participant from the grounds for cause at any time. 5. Caterer is required to reimburse SVMFF of any and all charges incurred on behalf of the Booth Owner including, but not limited to, permits and licenses necessary or incidental to the operation of Booth Owner's business at the Festival. 6. Caterer is also responsible to pay for the following utility fees. : Trash, Electric and Hot Sinks, which are listed in the fees schedule above. Hot Sinks are a requirement of Environmental Health Service. 7. A separate Check for $100 made payable to SVAA must be submitted with fees and signed agreement. The check will be held until the end of the Festival. If the area is cleaned and deemed to be acceptable, the deposit check will be returned. If the area is deemed unacceptable or the Caterer leaves without inspection, the check will be deposited. 8. Caterer may only sell what is on their approved Merchant Product List. Caterer will not deviate from the approved item list. Items not included on the Product Listing or that have not been approved may not be sold. SVMFF reserves the right to deny sale of items that have not been listed on the application. Any Caterer found with items not listed on the application and approved by SVMFF will be asked to remove them or leave the Festival without a refund. 9. Caterer owns the booth and fixtures, but SVMFF owns the rights to the food products and reserves the right to reassign food products to other Caterers or Festival, if necessary. 10. Caterer must register all participants and staff working at booth. SVMFF must be notified of all terminations immediately. Caterer must recover participant passes issued to terminated persons. 11. 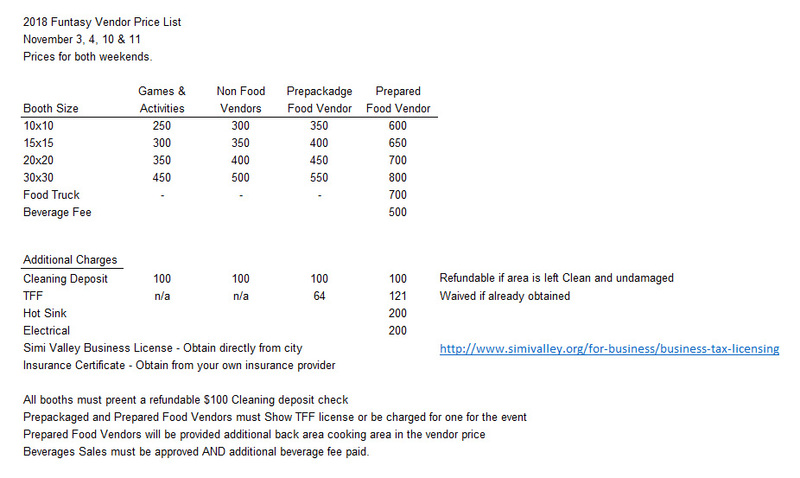 Caterer shall keep all booths and SVMFF property free and clear of any mechanical liens. 12. Drug & Alcohol Policy - Caterer and their employees or volunteers may not consume alcohol or drugs during show hours on the Festival site, nor distribute alcohol or drugs to anyone, whether a member of the public or a participant of the Festival. 13. Caterer agrees to the use of his/her name, photos, images, recorded voice or music by SVMFF, as well as its employees, assignees and licensees in connection with the Festival and without inspection for any commercial or promotional uses for one hundred (100) years. 14. Caterer may use approved SVMFF trademarks, trade names, or copyrights to promote their participation in the accepted festival during the fiscal year 7/1/18 to 6/30/19. No other use of SFMFF trademarks, trade names, or copyrights may be used for any other purpose or outside the stated time frame without express written permission. 15. Caterer must also provide current emergency contact number and information. This information, along with your booth number, booth name, address and phone number shall be securely attached to the front of the booth and remain up for the entire festival. 16. Caterer is responsible for acquiring their individual food service permit from the Ventura County Environment Services Department and must comply with all rules and regulations of said department. Caterer is also responsible for all fees to the Ventura County Environment Services Department for permit. Estimated cost is $141 per booth. 17. Caterer must be set up and prepared for inspection by 2:00 pm Friday prior to the event opening. If Caterer is not approved to open by the Ventura County Environment Services Department, they will not be allowed to open and operate and all fees paid to SVMFF are forfeit. If for any reason the Caterer's inspection holds up the opening of the Festival, a fee/fine will be assessed for every 15 minutes the Festival must remain closed to the public. 18. Caterer must use a Food Service Tent that is clearly labeled as fireproof. All components of tents/canopies/10x10 pop-ups to include sides, screens or other materials must bear a fire retardant certification seal of the State Fire Marshal (SFM) office. 19. Caterer will build and decorate within the theme of the Festival. Caterer will provide and use professional looking signage. Use of staples, nails, screws or bolts in living trees are prohibited. 20. Caterers will costume themselves and their workers within the theme of the Festival while in public view at booth, speak in language appropriate to the era of the Festival while in public contact, and assure that all booth personnel also comply with these requirements. 21. Caterer will provide proof of liability insurance on or before October 15, 2018 that shows that shows The City Simi Valley, The Simi Valley Music and Funtasy Festival, Simi Valley Arts Alliance, their officers, directors, employees and/or agents as "additionally insured". The address listed should be 3855 Alamo Street, Simi Valley, CA 93063. $1,000,000 per incident and 2,000,000 aggregate. Without insurance you will not be allowed to open. No refund of booth fees will be granted in this case. Please submit your insurance certificate to the Catering Coordinator by mail, e-mail or fax before October 15, 2018. 22. Caterer Agrees to provide own workers comp insurance and take care of own hiring. Caterer will insure that all hiring practices are in accordance with California State and U.S. Federal Labor Law. 23. Caterer agrees to hold the Festival harmless from any liability whatsoever: for any claim for injury (including, but not limited to bodily injury, property damage, fire, theft, explosion, damage incurred by the act of Nature), and for any loss sustained by Caterer or any person working for Caterer while participating in the Festival. This obligation to Caterer shall survive the termination or expiration of this Agreement, to defend, indemnify, and hold harmless SVMFF and its officers, directors, agents, and employees from all claims, demands, losses or liabilities, including but not limited to attorney's fees and litigation costs and expenses, for any injury or damage to anyone (including family, friends, guests, agents, volunteers or employees of Caterer) arising from Caterer's preparation for, travel to and from, attendance at and participation in the Festival, whether authorized by this agreement or not. 24. Caterer will be held responsible for any damages incurred by himself, his workers or his guests. This includes but is not limited to booth construction, any property left on site, driving a vehicle on site and/or any damage that may occur as a result. 25. Oral agreements cannot supersede this agreement. Any modification of this agreement must be in writing, and signed by both parties. 26. This Festival is a "rain or shine event". The producers will not be held liable for refunds or any other liabilities whatsoever for the disruption of the Festival due to reasons of enclosure in which the Festival is to be produced, before or during the Festival, destroyed by fire or other calamity, or by any act of God (including but not limited to weather), public enemy, strikes, statutes, terrorists, ordinances or any other cause. Producer has the option to cancel the Festival by October 15, 2018 and will return booth fees to the exhibitors. Producer reserves the right to alter the booth layout plan at any time. 27. Merchant acknowledges that there is the potential for wind gusts up to 70 miles per hour and is expected to prepare their space accordingly. SVMFF staff may not be available to provide additional labor in the event of high wind. 28. Any disputes arising out of or in connection with this agreement shall be determined by the appointment of a single arbitrator to be agreed between the parties or failing agreement within fourteen (14) days after either party has given the other a written request to concur in the random appointment of an arbitrator. Please fill out the required fields in the red highlighted boxes. Please fill out the missing fields highlighted in red.